Love the old pix! Keep them coming! Another great photo from days gone by! Pedestrian crossing signals that said “DON’T WALK” and “WALK”. Steve: And indeed the flashing greens are disappearing and are replaced by green arrows. I suspect it’s a question of standardization because some visiting drivers don’t seem to know what a flashing green means, and green arrows are in common use. From what I gather, the wide-spread conversion to green arrows has come about so that left turns can occur in both directions at once. A flashing green can only allow one direction to turn. The green arrows can still allow a single direction of traffic to turn and use the solid green light to pair that with straight-through flow if required. This is often automated with sensor loops in the turn lanes to measure the demand, a feature which also allows different timings for the left turns from each side. In this way if one left-turn phase ends before the other then the opposite straight-through green can clear sooner. It’s all about optimizing flow and automatically adjusting to the much denser traffic patterns that have developed. Steve: Thanks for clarifying this. The idea of bidirectional turns that only get a green arrow if there’s actually someone waiting on the detector loop is used on Spadina at many intersections. I guess this is where the roll sign indicting Coxwell and Queen came from? Steve: I’m not sure I understand the question. Keep the old pics coming. I am fascinated by them. Those old streetcar tracks still exist on Strathmore behind Woodbine Station. They lead into the parking lot where the streetcar stop used to be. They go up Cedarvale to Strathmore and into the parking lot. Just curious has the old streetcar trackage been ripped up in the past 50 years or just paved over? Steve: Generally just paved over, except for cases of major road works where, occasionally, a contractor discovers track that had been forgotten over the decades. You’d have to go to Boston for air-electric multiple unit PCC cars. We know that the picture was taken just before 1:35 PM since it got timestamped by National Trust’s clock. I do have a question about the transition to the subway though: Did the Bloor-Danforth car line’s track and wires remain passable between Keele and Woodbine after the subway opened for any length of time, and did any charters go out on there after the subway opened? Steve: No. Charters were not even allowed to go to Danforth Carhouse even though it was still in use, and it was pure luck that I happened on the equipment move to get shots on the Danforth west of Woodbine Station. The area looked far more urban in 1967, the “summer of love” (vs. the way it looks now in your Google street view reference). I think the old City of Toronto proper was a much better place before condo-mania and hipsterdom took over. Yes, we had fake hippiedom in 1967, but it was mainly confined to Yorkville. My question was stating how the 506 for example has a display that reads 506 COXWELL & QUEEN. I figured having to take the long way around to switch between Russell and Danforth Carhouses via Main, Gerrard, Coxwell and Queen was the reason for that particular display on the roll sign for the 506. Steve: The sign “Coxwell & Queen” refers to the loop on the corner, a favourite short turn for the Carlton car. It had nothing to do with the long route from Danforth Carhouse to Russell. Don’t forget that the CLRVs didn’t even exist until long after Danforth Carhouse was no longer used to store PCCs. In so much as that was the routing for cars switching between garages back in the day. I know the 506 was the Carlton car back then and the current roll signs didn’t exist. Steve: “Coxwell” was the sign displayed by cars running in to Danforth Carhouse from routes such as Carlton, King and Harbord (which terminated at Pape and Danforth). I remember that despite the B-D Subway opening on a weekend, on the following weekday people were waiting at the old streetcar stops at Dundas Street West and Bloor Street West for the Bloor streetcar that never came. There were B-D Subway opening advertisements in newspapers, radio, and television, there were notices at the streetcar stops, but still there were people waiting. In BC, there are full stoplights at pedestrian crossings. A flashing green light was on constantly at these crosswalks to alert drivers. When a pedestrian pressed the button to cross, the light would change to red. Were PCC cars still rolling in service on Danforth between Woodbine and Luttrell between the subway opening as far east as Woodbine in 1966 and its immediate extensions in 1968? Danforth carhouse would have been a perfect home base for such cars during those 2 years of transition. Steve: The CLRVs didn’t exist yet (don’t forget it was still over 5 years to the Streetcars for Toronto fights), and service on both Bloor and Danforth shuttles was with PCCs. The Bloor shuttle ran from Ronces, and the Danforth shuttle from Russell. It’s such a shame that, while the TTC retained the Bloor and Danforth stubs in order to make use of their streetcar surplus and hold back on a massive purchase of buses (especially in the face of the Bloor-Danforth subway’s imminent extension to Islington and Warden), that they didn’t spend a little bit of money building loops and retaining the Parliament and Coxwell streetcars. If they could have survived the opening of the Bloor-Danforth subway, they’d still be in operation today. Steve: Neither Coxwell nor Castle Frank Stations is designed to handle streetcars and that provision would have cost more than “a little bit of money”. Neither route was as heavy as the main east-west lines (which ran much more frequently in 1966 than today), and this was at a time when the entire streetcar system was slated for abandonment in 1980 with the opening of a Queen subway. The decision isn’t surprising at all. The mention of old streetcar track near Woodbine station reminds me of something I’ve been meaning to ask for some time. At Broadview and Main Street stations there used to be extra bits of track—I can’t remember exactly, but what I recall is a bit of extra northbound track north of the turnoffs into the stations. The turnoffs into the stations, in turn, were switches rather than the track simply turning. Also, at Broadview station, there was what looked like a vestigial extra track within the station area. I think this is all gone now with the renovations at Broadview and track replacement at Main Street. When I was younger I assumed these were relics of previous streetcar service north of Danforth (maybe up Broadview, across Mortimer or Cosburn, and back down Main? ), but as far as I can tell from various old maps this was never the case. Does anybody know the actual history of these tracks? Steve: At Broadview Station, the loop used to be further north on the property now occupied by a restaurant on the north-east corner of Broadview and Erindale. Streetcars went north on Broadview, east on Erindale (where they now travel westward coming out of the station), then counter-clockwise through the loop (and around a substation that was replaced by the one in the subway station). When Broadview Station Loop was built, the northbound track was left as a tail track for storing dead cars. This was removed when the station got a runaround loop track, and in turn that disappeared as part of the conversion to a two-platform station. At Main Station, there was a short tail track for storing dead cars on Main just beyond the loop entrance. Until 1955, there was no loop where Main Station is now, and the Carlton car went to Luttrell Loop, the east end of the Danforth carline. Neither of these ever went further north. Tail tracks were quite common, but they have disappeared around the system over the years and in some cases even though the track (and switch) might remain, the overhead was removed. See Kipling Loop. One place where track was laid but not used was on Pape where the double track went north of Lipton Loop (now Pape Station) in anticipation of an extension north to serve the industrial area in Leaside (where there is now a big box mall at Eglinton). The Pape Avenue Leaside bridge was built with extra steel (and TTC overhead poles) so that the carline could go further north. However, the Depression intervened cutting off this and other expansion plans. The bridge was widened comparatively cheaply from its original four lanes thanks to the extra strength provided for the streetcars. A similar arrangement on the Bathurst bridge north of St. Clair allowed for it to be widened. I love the old photo. I live just behind the businesses facing Danforth and it’s great to see how it has changed over the years. My mother and sister were two of those people. They waited a long time wondering where the streetcar was, until a passerby told them the subway had opened. On the first day after the wye was dropped, people were still remaining behind on the platforms, waiting the next train (which they thought would be a downtown train). 1. This is a poorer neighbourhood, and condo developers tend to have little interest in building in poor neighbourhoods. 2. Zoning, there tends to be a lot of NIMBYism along the Bloor-Danforth line resulting in a relative absence of condos. Compare this to the area along the Gardiner Expressway which has seen massive amounts of condo construction despite the lack of a subway, lousy streetcar service and heavy traffic on Gardiner/Lake Shore. Or compare this to North York Centre, which is a rich area and zoned high density so there is a lot of condo construction there. I think that if zoning is changed to allow higher densities along Bloor-Danforth and if this neighbourhood gentrifies there will be much more high density development here. There is a lot of demand for condos in Toronto because of the greenbelt, so I think that in the long term subways will bring moderately high density, even in cases like Sheppard (and in the short term, reasonably high ridership on that line will be guaranteed by the high traffic volumes on the 401 and the overcrowding of Sheppard East/Finch East). Steve: The point I was driving at is that the TTC often talks about subways and density as if they naturally follow each other when the situation is far more complex. The Danforth subway gets its demand largely from areas further east of Woodbine, just as the Yonge line gets its demand north of York Mills. Feeder services are crucial to building up high density demand, not just development. Poor? The area around Woodbine and Danforth is marketed as the “Upper Beach”. Further west, you’re into Riverdale and the Playter Estates, not exactly shabby neighbourhoods. There are pockets that are not at the same level, but they are slowly gentrifying. Whether they will redevelop, other than some land assemblies on Danforth itself, remains to be seen. The subway has been there since 1966, it’s often overcrowded in the rush hour, but this part of the line is not full of high rises. As for southern Etobicoke, those were industrial lands and the old motel strip. No surprise that they redeveloped, and were attractive despite lousy transit because they’re right beside the Gardiner. Great for people who are not commuting to downtown, and very car oriented. Steve writes: The idea of bidirectional turns that only get a green arrow if there’s actually someone waiting on the detector loop is used on Spadina at many intersections. This system is also used AFAIK on St Clair West where it meets side streets, at least during off-peak periods. The west end ran from Keele station to Jane loop. Cars were fed in from Dundas along Bloor tracks. The east end ran from Woodbine to Luttrell. Cars were fed in from Main street (the Carlton line). Even if service was forbidden from Woodbine to Coxwell, we did have charters that ran over the line from Dundas to Keele. I remember that during the last week of the shuttles, 4575 ran on the Bloor line. Steve: When I talked about track being unavailable, I meant the tracks between Dundas and Cedarvale where there was no scheduled service. Yeah, the flashing green tells drivers that it’s a pedestrian activated traffic light (and that a car from the side street may dart across, since the side street only has a stop sign and not a (red) traffic light). Drivers from Ontario often get confused in BC when they see oncoming traffic run through a flashing green. Density: the key is that there is a fundamental difference between development patterns in most of the older Toronto neighbourhoods (generally south of Bloor/Danforth) and the post-war suburbs. Old Toronto generally consisted of uniform low- or mid-rise development on small lots. Post-war Toronto became more oriented to mid- to high-rise buildings (in large landscaped lots) along major arterial roads, with low-density housing in the interiors. Much of old Toronto is actually fairly high density by a suburban standard, although it may not appear so because it is a uniform density and largely typified by low-rise development. (The City’s online mapping has a layer showing property lines, which illustrates this really well.) This uniform high density in turn supports the more closely spaced transit lines and other amenities (retail strips, libraries, schools etc.). Low-rise does not necessarily mean low-density. One practice that I do not see current streetcar drivers do is to move ahead on a yellow light. I remember on the Bloor streetcar trains, after boarding of passengers, and the traffic light turns yellow, the whole train move through the intersection. Very soon, the other direction might get a green light, however, the second streetcar is still moving through the intersection on a red light. Even regular streetcars had that practice of moving through a yellow light. Unlikely these days as it is now required that streetcars are no longer considered railways. Steve: This was published as a postcard back in the days when the “Mink Mile” was just starting to get its new high-rises including the Colonnade. 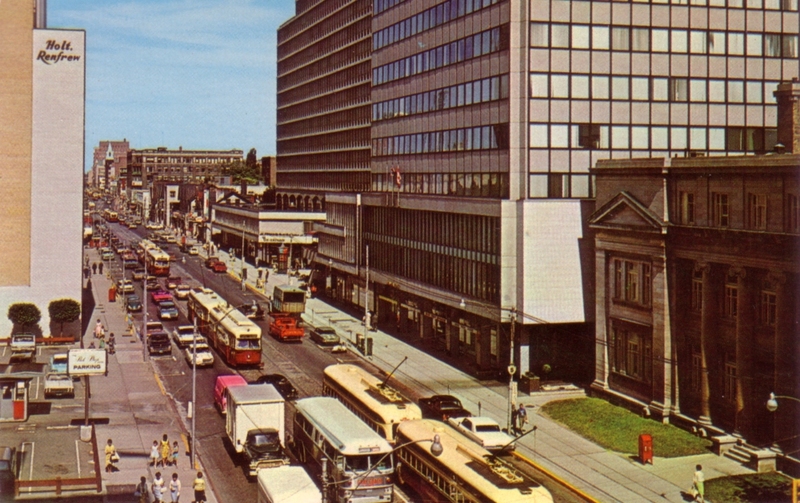 Holts was a bit further west in those days than its current location opposite the Manulife building. That said, many other cities have the lights configured to provide a left-turn signal at the end of the green phase if there is a demand for it and it wasn’t provided at the beginning of the phase. I suspect that there may be a number of locations in the GTA where this could be beneficial to traffic flow, but given it is another “not invented here” concept, we probably will never see it. There are some signals in Ontario that do this but in the GTA the left turn lanes, especially in the 416, are short and if you leave the turn phase to the end then cars will back up into the left through lane and hold up traffic. Turn sequences, total cycle time and length of green phases are a function of many factors, one of which is intersection geometry. When I moved into the area in 1987, the Kresges and Woolworths were still there, complete with their lunch counters. They would still be open for another couple of years. Down the way (barely visible in the photo) on the north side, was Danwood Jewellers, which was owned by the oldest and longest of our family friends (though they didn’t buy it until the 70’s). BTW, if you were in Kresges or Woolworths, you were more than likely to run into practically the only human Glenn Gould had regular contact with before he died: Victor di Bello, who himself was a fixture in the neighborhood for decades. Steve, thanks for these pictures of yesteryear. Please keep them coming. Steve: all my life I’ve never heard it called anything but the Leaside Bridge – where does the name “Pape Avenue bridge” come from? (I’m pretty sure you don’t mean the footbridge near Gerrard Square). Steve: Sorry about that. Yes, I meant the Leaside Bridge, and I have corrected my remark in the comment thread. Again, thanx for the memories. 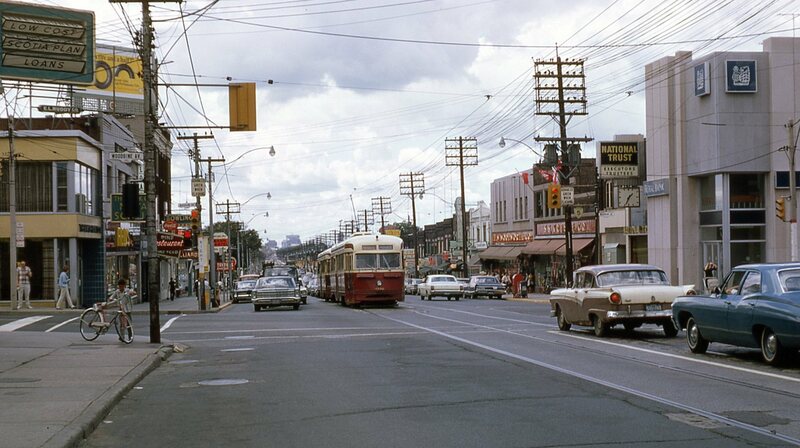 This pic is fun as it shows my neighbourhood a few years before I moved into it. The two Air cars, with the second having its pole hooked, reminded me of the late 60s on a Saturday morning when I worked at a hardware store on Queen at Broadview. That particular morning I was sweeping the sidewalk, as was the norm each a.m., when a train of 4400 series PCCs went by. At first it was just another PCC train, common as, well, as common as streetcars on Queen Street. Then the light bulb lit, it was Saturday. A train on Saturday caused me to do a double take. By the time they passed me and I looked again, the angle of viewing was such that I couldn’t tell if they were connected by their couplers or by drawbars; but there were three of them heading west. The trailing two had their poles hooked down. This was a sight I’d not seen before nor had seen since. One of those, “If I hadn’t seen it myself I never woulda believed it” moments in life! The other memory that was stirred by this shot was that of my favourite Air Car, #4275. Another one of the wartime cars and nearly identical to and from the next batch as your pictured 4270. 4275 had loose trucks and as it wound its way around the city it would clank as well as issuing all of those unique Air Electric sounds. Unfortunately a truck rear ended it and burst its air tank. Even though it wasn’t long for the world anyways, it was retired without being repaired and therefore wasn’t afforded the opportunity to live out its remaining natural life, which would likely have been another year or so of rush hour use. Isn’t the ‘official’ name the “Confederation Bridge”? I seem to recall hearing that when the bridge of the same name to PEI was first opened. Steve: According to Wikipedia, you are correct, although it’s an old name from the 60th anniversary of confederation when the bridge was built.